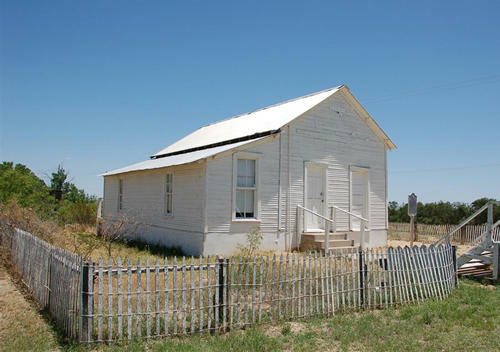 Hovey School, a Texas Historical Landmark. 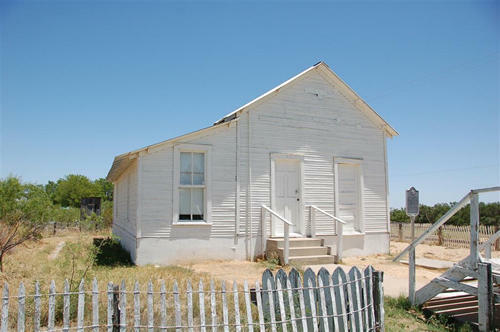 The Hovey school house was moved onto Ft. Stockton's Historical Center, on the Old Fort grounds in 1987. The old wood frame school house was moved to the renovated Fort Stockton grounds, located to the north of Comanche Springs in Ft. Stockton. 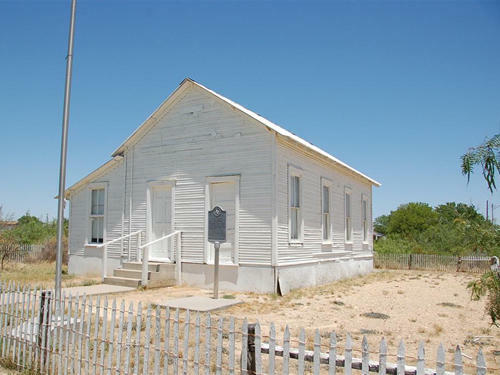 The schoolhouse has been painted and generally gussied up with desks of the period for which it was used for educating neighboring rancher's kids. My mother, who is 76 went to grade school in the old Hovey schoolhouse. In later years, it was used for get-togethers by the ranchers. There probably still remains a large concrete slab for outdoor dancing, in front of where the schoolhouse was located. An upraised stage, attached to the front of the schoolhouse, provided a place for the dance band to perform. 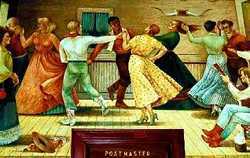 The dances on the pavilion were the Texas Two-Step and Waltzes (who'd have known). My mother learned how to dance there at the age of 7. It must have taken, cause she's still dancing - nearly 70 years later. The windows of the school were simple glass-paned windows that could be raised or lowered. On each side of the windows were "drapes" (hemmed burlap), on which all of the local rancher's brands were displayed. Their branding irons were dipped in red paint and then carefully applied to the drapes. The windows were left open to let in the cool night breeze and let out the smoke from the men's rolled cigarettes, and pipes. From Mother's memory - The classroom (large front room) was heated by a wood-burning heater. The kitchen had the wood stove, and the teacher's bedroom (next to the kitchen) had a kerosene heater. The teacher lived "on campus". There was a "two-holer" behind the schoolhouse. A hand pump for water was outside. That, plus a pretty view of the Davis and Glass Mountains, were pretty much it for amenities. There was only one teacher employed at a time. The kids were rancher's kids, and the children of the men who worked on the railroad. At the time mother was in school (about 1931 to 1938), the grocery store, post office and town were alive and well. I don't know what caused it all to die- but suspect it had something to do with better automobiles to school kids in Alpine, and the ultimate demise of that length of the railroad. In the late 40's, and during the 50's, as the ranchers got older, the schoolhouse became the scene for the monthly "Hovey 42 party." In all, there were probably 20 to 30 adults and sundry kids attending. Good country cooking was brought, and kept warm in the old school kitchen stove. As the kids got older and braver, we would climb to the tops of the freight cars on the railroad siding and run and jump the gaps between cars. 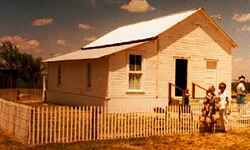 "42" is really pretty boring- and so may this little remembrance, but, the real history of the old school house is available when you tour it, in Fort Stockton." - Former area resident, Barbara K.
About 1910 a railroad stop named Hovey was established about 40 miles west of here on The Kansas City, Mexico, & Orient Railroad. By 1913, Hovey contained a depot, post office/general store, and several stock shipping pens. 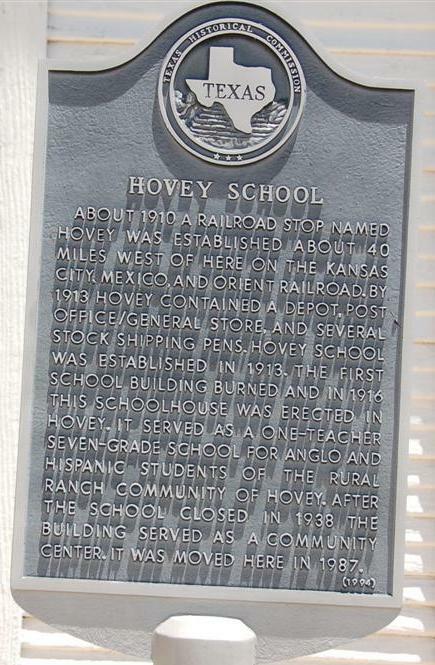 Hovey School was established in 1913. The first school building burned and in 1916 this schooolhouse was erected in Hovey. It served as a one-teacher seven-grade school for Anglo and Hispanic students of the rural ranch community of Hovey. After the school closed in 1938, the building served as a community center. It was moved here in 1987.